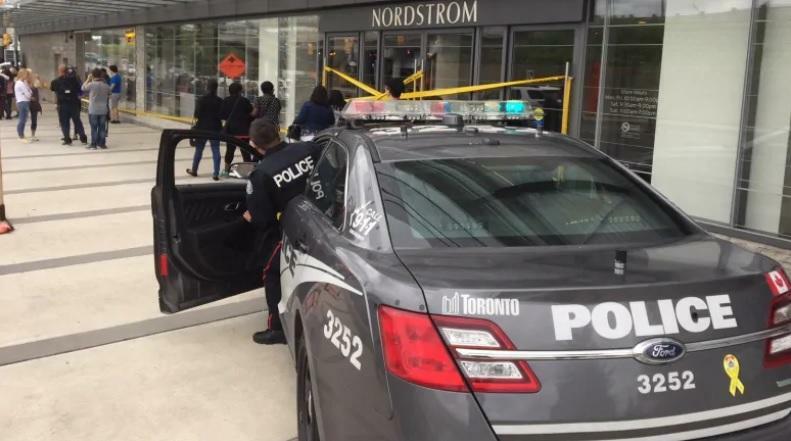 A gunfire sent people scattering at Toronto's Yorkdale Shopping Center Thursday when a shooter opened fire in the busy complex. Witnesses reported "a number of 911 calls" to police around 3 p.m. Estimated Time saying that a shooting had occurred, according to Supt. Rob Johnson. A nearby witness who was at a Tesla dealership filmed the moments following the shooting. Police say the shooting started when an altercation broke out between two groups of men near the southeast corner of the shopping center. One of the men then pulled out a handgun and fired at least two shots before the two groups fled the scene. Investigators announced the suspects are two men in their 20s, one of them could be still carrying the gun. "We are in the process of interviewing witnesses and looking for evidence," Supt. Johnson said. No one was hurt in the shooting other than two people who sustained minor injuries during the panic. One person was transported by paramedics to a hospital but it was reportedly for an issue not related to the gunfire. The mall announced on Twitter it would remain closed for the rest of the day while police conducted their investigation. "Yorkdale is secure and we are co-operating with police to safely evacuate the centre," the mall tweeted. "We expect to open as scheduled tomorrow morning at 10 a.m." Supt. Johnson said officers helped employees get back into the mall to retrieve their things and lock up for the night. The same witness uploaded a video of his escape route out of the back of the Tesla store. CBC News videographer Mary Webster reported being in the mall when she heard a loud bang. "People were crying," Webster said. Another witness said, "We thought it was a balloon or something popping, it just didn't register what it was."